Concurrent Engineering - Windings Inc.
Concurrent Engineering is the practice of receiving product manufacturability input throughout the product development process. This approach provides Windings’ customers a very efficient and effective way of optimizing a design to meet the client’s desired balance between performance, manufacturability and cost. 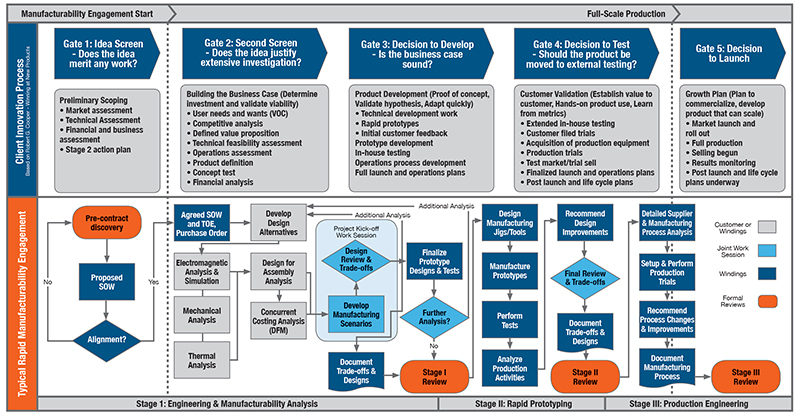 The sequential nature of traditional product development methods often results in numerous design modifications as manufacturing engineers attempt to produce the “ideal” designs they inherited from the design engineers, driving unnecessary project cost overruns and schedule delays. By considering manufacturability throughout the process, manufacturing issues can be identified and resolved as they surface, resulting in a better overall project outcome for the client. Depending on client need, Windings’ engineering resources can be engaged at virtually any point in the product development cycle, from application analysis and design ideation to prototyping and full-rate production. Upon initial engagement, Windings will work with the client to define the scope of work and assign ownership of deliverables. This stage involves close collaboration between Windings and the client to determine the most strategic path to achieving established project goals.